Let me begin with, I really wanted to enjoy my expireince here, especially as a freshman coming into something new, what freshmen doesn't? First, i wanted to say, I am going to honest and tell my point of view on things, so that means I will obviously be subjective towards this, some may agree and some may disagree. Okay, so I got accepted into UMW this past spring (I guess that was a no brainer). Immediately, I started looking about on websites to see what the students had to say about the school and stuff itself, because let's be honest when you tour or have orientation there, well the objective is to convince you to go there. I read the reviews including this website and most of them were negative, and the same issue for many poopped up, I ingnored it thinking it was just someone was trying to be negative and cause drama. Well, in the end, in my own opinion, they were correct and i agreed. Okay, so enough of that, I am not going to completely bash everything about this place, I will admit the campus is very beautiful and I did have the fortune for having professors that were actually nice, knowledgeable, and genuinly wanted to see the students pass. But, that is all I can really think of in terms of what I can look at as being a positive. Now, moving on to the not so lovely things… so, this campus is small, and it works for some, and for others like me, not so much, so don't expect really anything to go on during the week and especially the weekends ( A lot of people go home on the weekends). Social life, is eh… I mean there is clubs, but depending on the club, not very many people meet. Party wise, non-existent or maybe i just don't know because half the time you have to keep it a secret because the party usually shuts down. I mean i get it drinking can be dangerous, but party life, believe it or not improves your social skills, you get out there, you talk to different people and have a good time, that's part of developing social skills and I hate to say this but "benching" is called people watching go to a mall and do it, like it's not a thing UMW made… sorry not sorry. No greek life, so if your looking for a school with that, hate to burst your bubble, it's not here, not that I wanted greek life, I could care less but I know people choose schools based on that sometimes and that whole topic is a whole other debate in itself. The food is eh. That's about it on that. In terms of classes, majors, and registrations, I'm neutral on this. Classes are small…if your in a seminar or upper level courses. Majors, well it's a small university so not many options will be available, they do offer Historic Preservation so if you like that sort of thing all the more power to you, the department is nice and really good. Registration time…seriously can be stressful, i remember my blood pressure went so high, oh my, i don't want to relive that. Anyways, around this time a lot of the classes you WANT AND NEED get filled up and fast to on the count of the fact everyone else is on the same boat as you, so you might or might not get in it. Now, on to my *personal favorite* the students, okay so I am no going to lie, there were some friendly, approachable, real, and down to earth people I enjoy talking to and being around. But, (there's always a but) most of the time, I found many of the students especially to be arrogant and very close-minded you don't agree with them…like uh? okay for a campus that promotes that kind of thing to be open minded and tolerent of people, it sure seems like the opposite to me. I tried being nice to many people and believe me, I am not a confrontatinal or mean spirited person at all, I guess people must've thought I was the spawn of satan, because hahaha god forbid if I saw "Hi, I like your sandals. ", I am known to be weird (true story). But I mean it's whatever, there are like i said a few good hearted people. The majority also tear down other universites on that yik yak app and it brings it back to the fact that if many students preach and make an issue about being nice and open minded to others then why make fun of people that go to other schools? Like sit back down, you ( and I ) got into a school with an 80% acceptance rate. Stop acting like your the greatest creation of humanity. 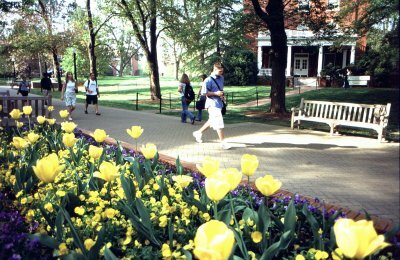 The only other thing I got to say about the student body is if your looking for a campus with like lots of diveristy then well "UMW…Univeristy of Mostly Whites" may not be the best call, but it's up to you. Now, safety and the surrounding town and locals and all that other stuff, safety well it's for the most part safe to walk around at night, the only things that happened are, is a girl got raped in the parking deck and someone got held at knife point infront of i believe it was George Washington hall… I can't remember, and some guy who was like a suspect escaped onto the campus one day…idk what that whole thing was about. The surrounding town, well being a local, I know Downtown Fredericksburg can be a cute little area to look around once in a while but there's not much there than antique shops and restaurants. There is a mall, but you have to find a way to get there and usually it's by the Fred Bus which a lot of people don't like to take, I don't know why, because I have been on it quite a bit, and I am still alive. Other than that, the surrounding areas and locals are 50 you either get nice ones or plain old grumpy ones. The dorms…hmmm… if you do go here I recommend Mason, Ball, Virginia, or Marshall (but it's down a hill). Another thing, I will talk about is financial aid, MY GOD, all i can say it was lackluster and frusturating. ONE LAST THING, I promise is the fact that I notice a lot of the time a so called "well-known" school shouldn't have to advertise on places such as Buzzfeed, Pandora, and Spotify, because being a top liberal arts school in the south (yes, VA is in the south) is well I hate to burst yet another bubble is kind of uncommon. Okay, well I think i pretty much said a mouthfull, I just wanted to tell the truth on how i expierianced things here, I was not satisfied and I am transferring, I just wanted to bring perspective on whether or not someone is on the line for going here. Me? If I had to do it over, I would choose my second choice school and not pay the money I had to out of both my pocket and my parents pockets for the somewhat mediorcre education and expireince I had there. I wanted this to be a neutral but unfortunately the bad far outweighed in the end. Well, this post is full of many commas and grammatical errors, but yeah, like I said think it over, listen to the reviews, and in my opinion don't go here or go here, it's up to you. Wheteher or not you agree or diagree with my review on this I sure hope you take the time to look over and think about coming here.